The whole purpose of this website is for the pollination and exchange of ideas and for this website to become a repository of ideas for those who seek awareness beyond the physical senses. We are more than our physical body. Ideas are powerful things and indeed our lives and the whole of creation is but the creators idea. life is experienced based on our idea of what life is. Ideas have existed throughout time and have been bequeathed from Father to son, Mother to Daughter, generation to generation. You see, “life is just an idea.” My idea is to help others by instilling within them the empowering knowledge of their origins and the power of their capabilities. The ideas that have been perpetrated by societies, governments, cultures and mass media, don’t need to be “our ideas.” If you live in the USA we are told we are free. The question is, are we really free? When one breaks free of the idea of the ego then one truly becomes free. There are no limits to confine you anymore, there are no self imposed or learned limits to what you can create. True freedom occurs when you attach yourself to nothing. To help others in the progression and expansion of consciousness ultimately leading to soul growth, happiness and divine consciousness. We are each living our own reality based on an idea. It is our individual idea of what we think life is to us. 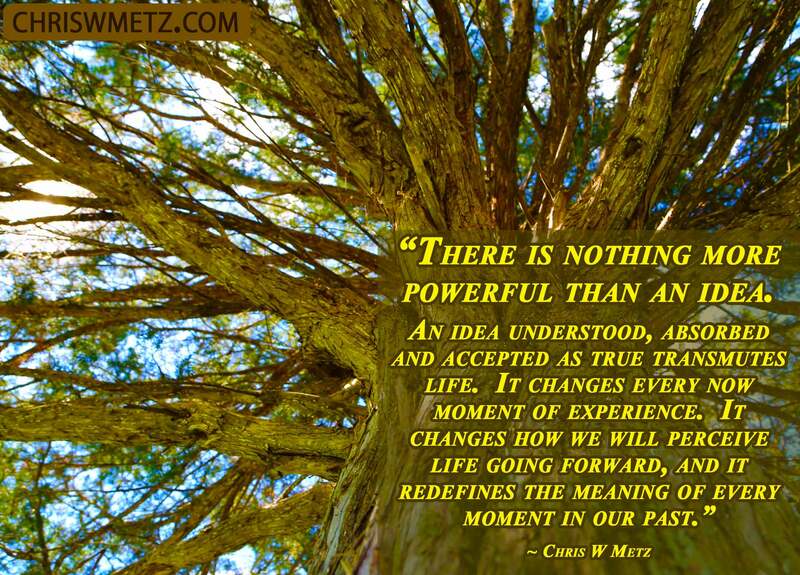 We have lived every moment based on this idea and it has shaped and molded our experience of life. If I were to ask any old person what their ideal of life was when they were young, they would be giving me the framework for how they lived their life. Indeed, they would then tell me this is how their life turned out. Just as grasping one new idea or concept changes our perspective of every moment forward, so too it rearranges and redefines the meaning of every moment in our past. The power of an idea can literally change our life in not just the now moment but every past moment and every future moment. It literally has the power to cross over lives and create effects on planes we are hardly aware of. In a very real sense it alters our experience and alters what we become. An idea absorbed and accepted is integrated into our soul seed to be reborn within the pattern of our existence. My revelation/awakening gave me a new idea, this was not my idea but someone or something else’s idea was given to me that morning, and it changed my life and my perspective of life going forward. This new idea changed every now moment I experience. Going forward my perspective of how I view life is forever altered. Simultaneously it has redefined the meaning of every moment in my past. Many speak of truth and indeed I have spoke of truth being the ideal of love, with love being all that matters, but if we define something as truth and truth is defined as a universal truth by which all other reality is defined, then we have to ask ourselves whether we can truly call it truth. Perhaps we call it truth because we think of it as the creators original idea and so we call that truth. But the fact remains that it is still an idea, proving once again that there is nothing, and I mean NOTHING! more powerful than an idea. There is a connectedness to all things and within ourselves we contain a blueprint for its discovery. This may sound hard to believe, but we are already programmed with this knowledge, but the only way to uncover this knowledge is through ones own desire, there is almost no other way. Occasionally people are given this knowledge through the sheer gift of grace. In most cases however it is only through ones desire that this knowledge is given to them. This is a very peculiar thing because we don’t normally think of our spirituality as a desire to be manifested, but yet that is exactly what spirituality is. It is the desire to uncover, to know our own origins, our own purpose, our relationship to everything that exist and our own relationship with the creator of all things. When we start on the path of this desire it will unfold within us and this is the process of finding ones own spirituality. Consciousness and awareness can be likened to the four stages of the learning process. We cannot know something if we don’t even know it exist. In my coaching experience, the most fundamental value I give to others is a beginning awareness of what they do not know exist. After one has this awareness, it is up to them to pursue further learning with desire, without desire, nothing happens and I can offer nothing without that desire. Unconscious Competence – We have mastered the skill or understanding, it becomes automatic, no longer requiring conscious effort, we just know. What is consciousness? Could it not be described as a measure of experience? For to know of something is to have experienced it in some form or another. Could consciousness best be described as awareness? What would define consciousness? It is the awareness of greater and greater realms of reality until one knows, this is the state of mind which is pure awareness. Awareness is mind at rest, thinking creates motion and produces material reality but consciousness is pure awareness, the stillness of knowing. Everyone is familiar with the term “soul.” We know it as something existing within us, or something we have, or something to “be saved.” The soul is the entity that develops with the history of all it’s experience. Ok, but how does this knowledge affect us? We live our lives everyday with the faint consciousness of our eventual physical death, yet that knowledge doesn’t truly affect our day to day living. Now suppose that you learned you had one week to live, does this not change your entire perspective of the next seven days of your life? This awareness is suddenly thrust front and center into your consciousness and profoundly changes your attitudes and behaviors for the next seven days. Full awareness of the soul is similar in that our perspective is altered greatly with the full conscious awareness of our soul. How do we know the soul really exist? Believe it or not, there is plenty of evidence of it’s existence, if one looks for it. Perhaps the greatest evidence comes from a number of documented cases of past life regressions in where people describe previous lives. In these cases people describe their previous lives in such detail that it would be hard to conceive they were made up. People have described towns they have never visited in their current life, recalled their names and even the circumstances of their death. Understand that everything exist on a scale, sadness and happiness are the same thing they are just on opposite ends of the same scale. When I speak of helping others in the progression of consciousness to divine consciousness, we are talking about the movement along an axis from complete ignorance to full God awareness. This happens over eons of time and it is rare for it to occur within one life, rather it is an eventual progression over many lives. Any knowledge or awareness gained in any lifetime is taken with into future lifetimes.